Large Planters for Commercial & Outdoor Spaces. 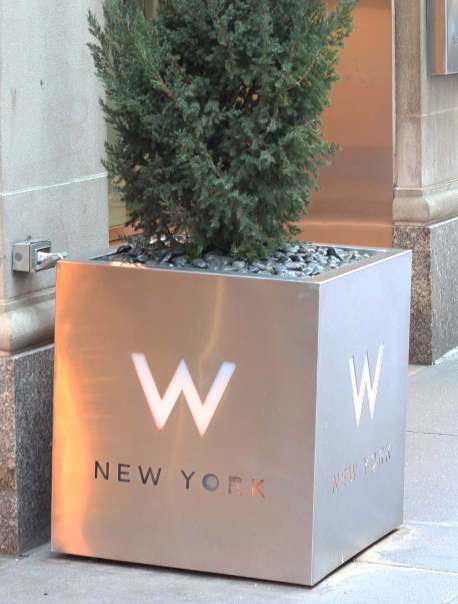 Our Aluminum, Steel and Concrete are excellent materials for planters to be located on city streets, corporate buildings, commercial enterprises, Hospitals, Hotels or other publicly accessible properties. Yard Art can point out value added ideas for your commercial project in the planning phase through project completion, Made in the USA. Are You worried about installation and maintenance of Your Planters ? Accessories for Easy Installation - Yard Art has integrated options for your commercial planters that make the installation easy and seamless. 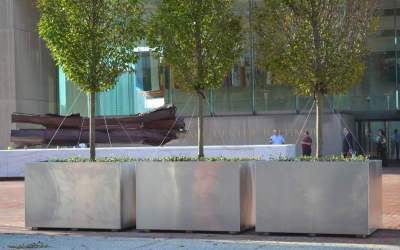 For metal planters being installed in a publicly accessible area, such as a city street, hidden surface mounts make it easy to secure the planter to the ground with no visible anchors. In the situation that your install area is not level, there can be adjustable feet welded to the bottom of your planters to make the adjustment process simple, in an attractive fashion. Drainage Fittings and Irrigation Sleeves, are both convenient ways to deal with your irrigation water going in, and handling the direction of the drain water going out. Other commercial areas such as a restaurant planter might find it useful to incorporate a matching drip tray. You can read about all of these commercial planter options and others here. 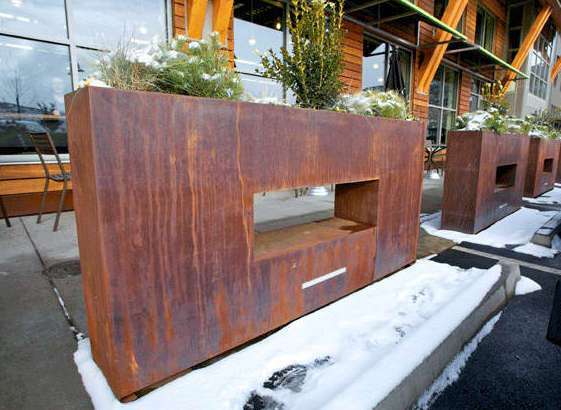 Let Yard Art guide you through the commercial planter selection process. We will help you choose the proper material and build them so you feel confident that this piece of your project was a success.